In this week, we present you our review on the German equity index DAX in the JRC Capital Management Weekly Outlok. So far, it has been a rough year for the DAX. Since the beginning of the year, the price dropped by almost 10%. Uncertainties regarding the Brexit, news about the trade war and recently the Italian budget crisis were major factors for the downtrend. Particularly in October, indices all over the world suffered from losses. Media referred to that as Spooctober in regard of Halloween. However, in the past days there was a slight recovery in the DAX. It is earnings season; hence, several DAX-companies will publish their figures. Investors should keep an eye on the reports of BMW, Continental, Telekom, Siemens and Allianz. Furthermore, it is important to focus on news regarding the Brexit and Trump’s negotiation with China. In addition, the Federal Reserve will announce their decision for the interest rate. A hike is not expected in this session, but the subsequent press conference may contain some information if we will see a fourth rate hike in December. The pressure on the DAX was very high during Spooctober. High to low the DAX lost more than 1400 points. However, will we see a year-end rally after the Spooctober? First positive signs occurred at the end of October. After the DAX reached its low at 11051, the price recovered and rose over the important level of 11500. 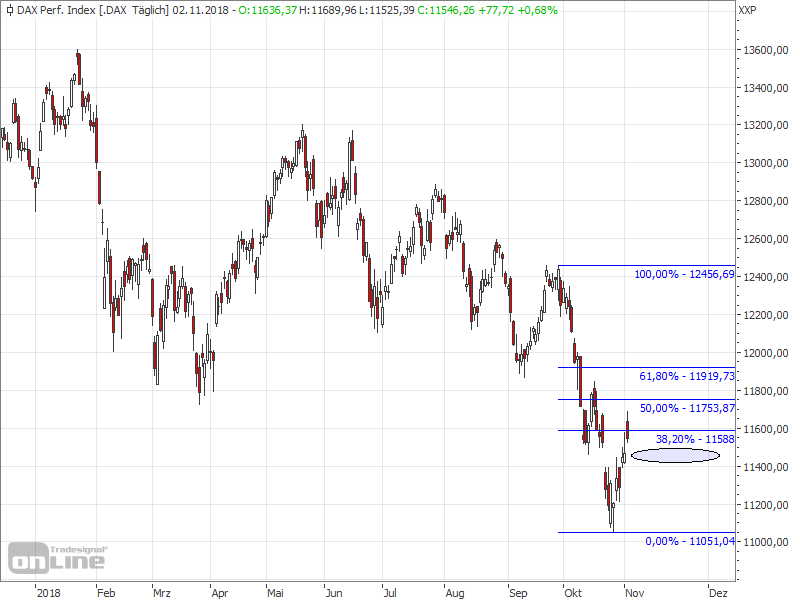 Meanwhile, the DAX is at 11546 slightly below the 38.20% Fibonacci Retracement. If the recovery continues, the first obstacle will be at the 50% Fibonacci Retracement at 11753 points. If the price rises above this level sustainably, another resistance can be located at 11919, the 61.80% Fibonacci Retracement, in combination with the 12000 points level. If the downtrend continues, an important support area is located above 11400, where several gaps are situated. On the long run, the main goal for the bears is to push the DAX below the low of the year at 11051, in order to confirm the downtrend.